The DART Aerospace EC130 Heli-Utility-Basket has been the only external cargo expansion option of its type since arriving on the market in 2010. 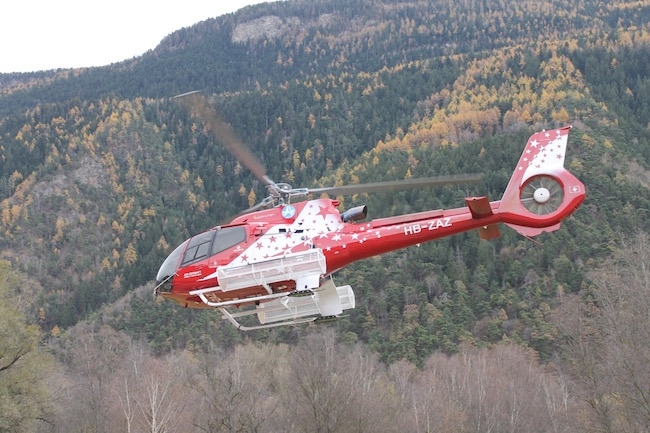 When Air Zermatt, world-renowned alpine search and rescue operator and longtime DART customer acquired a H130 (EC130T2), they purchased the DART basket. CEO and pilot with Air Zermatt Gerold Biner described this product as “an indispensable tool for our versatile operation”. Since the initial certification flight tests for the basket were conducted on an EC130B4, Air Zermatt quickly found that their H130 was capable of more with the basket installed. In November 2016, DART sent a team to Switzerland to retest the basket with Air Zermatt’s newer variant. “Our goal in going to Zermatt was to be able to offer our H130 customers reduced VNE (never exceed velocity) and hover performance penalties with one or two Heli-Utility-Baskets installed”, said David Shepherd DART VP of Certification. After 4 days of flight testing, the team was rewarded with a 200 kg reduction in hover performance penalty as well as a 25 kias increase to the VNE with the basket installed. “Air Zermatt is a world class organization”, said Shepherd, “DART is very appreciative to the staff at Air Zermatt for their support and professionalism during the performance of this flight test activity”. The H130 Heli-Utility-Basket features the automatic locking handle and robust hinge system typical of DART baskets and is certified for installation on H130’s operated under the FAA, EASA, Transport Canada, the Russian IAC and Brazil’s ANAC.